Swimming strong is about building athleticism that compliments the demands of moving through the water efficiently and powerfully. Dryland training, at the pool and at home, is a valuable addition to any swimmer’s routine regardless of age or fitness level. The goal of this series is to increase the swimmer’s range of motion while building strength and mobility. 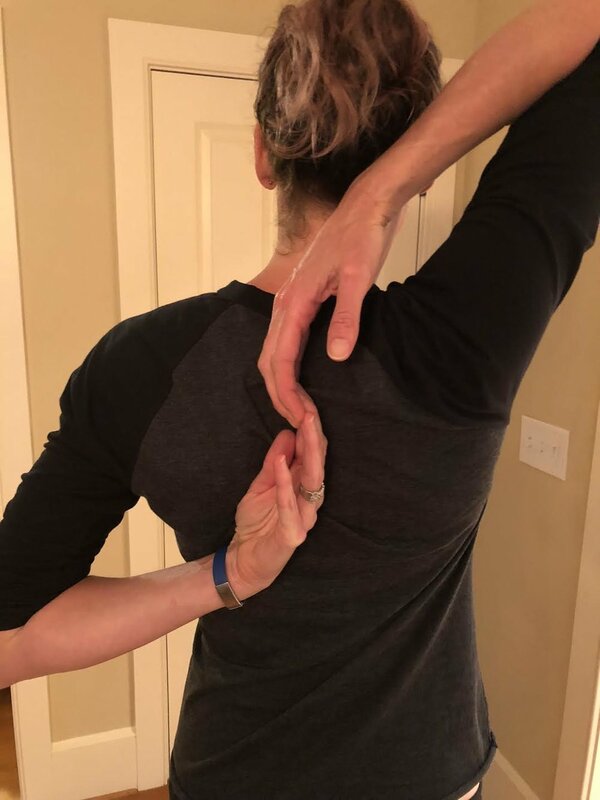 This fundamental movement pattern work aids in injury prevention, tightens connective tissue, and improves swim mechanics and strength. The Swim Strong Series will present dryland exercises in progressive phases. Each phase builds upon the previous phase. The early phases will focus on range of motion, mobility and stability then progress into strength and resistive exercises. Phase I teaches the following exercises: Posture Row, Supported Hip Hinge, Toe Sits, Heel Sits, and Plank. “This is a DRAG clinic” with Coach David C. Graham Registration Open Now! Own your Walls - We will be focusing on both ends of the wall, the in and the out. It is common for so many swimmers to set up their turns on the approach which leads to the decrease in speed as we approach a pivotal point in your race along with focusing on increase distance and efficiency as we leave each wall. Killer Streamlines - We will be looking at the 4 common types of streamline we are seeing nowadays along with analyzing which one works best for you. Reducing Frontal Drag - We will be discussing as a group, the common ways and things that are slowing us down in the water when it comes to frontal drag. Once in the water, we will play with some broken swimming vs more aligned/streamlines positions and practices to aid in reducing front drag. ***Coaches - Would you like to gain experience by supporting this clinic on deck? Please email Crystie at NEcoaches@usms.org to learn more. David C. Graham -- A native of NJ, he now calls southern NH his home and works at the Town of Swanzey in the Finance Department. David serves on the adjunct faculty list at both MWCC and Franklin Pierce University and this fall, as a volunteer Assistant Swim Coach at Keene State College. Swimming since the age of 14, Coach Graham has been an avid supporter of masters swimming since returning to the pool 10 years ago and competes regularly as a member of the Granite State Penguins at local meets as well as 3 USMS National Championships and the FINA World Masters Championships hosted in Montreal in 2014. 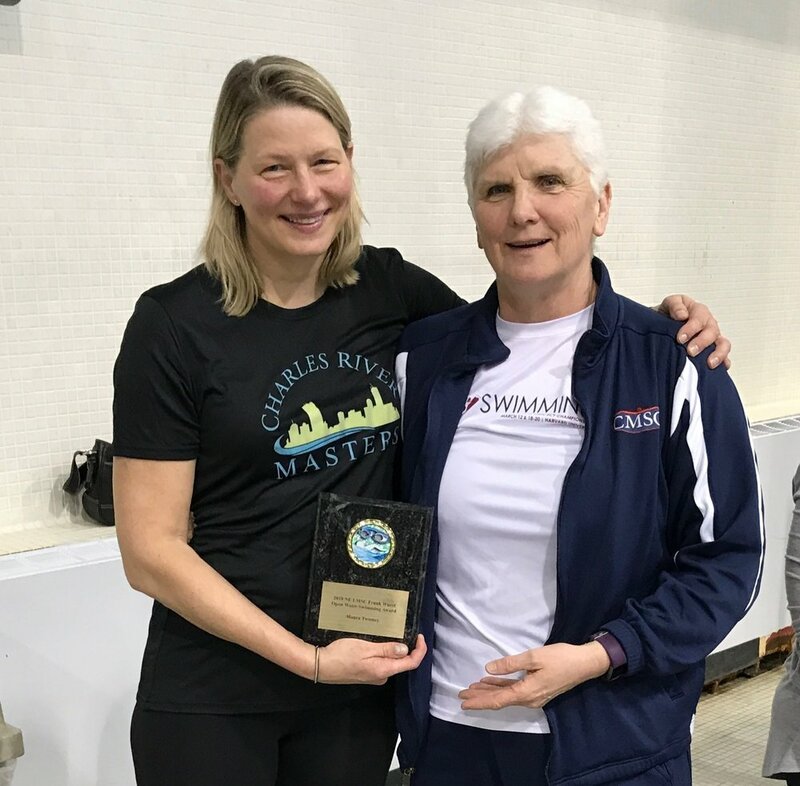 Coach Graham is a Level 3 USMS and ASCA Masters Coach and has previously worked in the aquatics arena as a professional for more than 15 years. This year he was awarded an Appreciation Award by the LMSC and was selected as the LMSC Coach of the Year in 2015. Coach Graham will be presenting a clinic, This is a “DRAG” Clinic, based on his learnings from the National Coaches Clinic on January 27th at Simmons University. 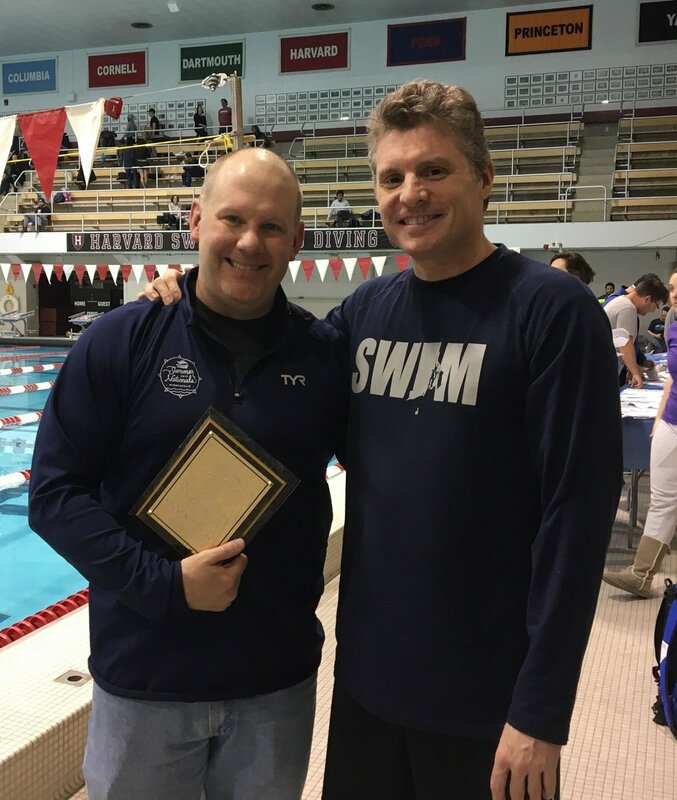 I’m not exactly sure when I started thinking about the takeaways from the USMS National Coaches Clinic (NCC) in Maryland. I remember leaving the deck on Sunday from the morning pool session and starting to ponder it. I bid our fellow New England coaches from the Cape a safe journey home (they were driving), and then corralled 3 other NE coaches into my car for a drop-off at BWI. The conversation turned to thoughts about the clinic and we threw around some of the highlights and a few lowlights as well. Once I left them curbside at their respective departure gates, my drive was about 3 hours to my aunt’s house in New Jersey, where I would stay the night and finish the drive home to New Hampshire the next day. Today, I looked at my notes; not so much the ones that I took at the clinic itself, but the scribbles I wrote on 3 sheets of paper once I arrived at my aunt’s place, and then the 2 more from after I arrived home. I guess the 8 hours spent in the car allowed my mind to wander to the weekend with the topics and notions presented. It truly was a great weekend: 80+ coaches from all over the country, together for the sole purpose of not only to further their knowledge, but to absorb that knowledge and be able to bring it back to their swimmers to enhance their ability to perform in the water. I got to meet many new coaches from across the country and catch up with some I have not seen in a while. I was particularly excited to see Coaches Tim and Dean, the USMS coaches for 2014 Masters Worlds in Montreal, my first big meet, and I am forever thankful to them both for their support and friendship at that meet and beyond. One of the things that stood out in my experience at the NCC was the varying approaches that coaches from across the spectrum have for just about anything. Listening to Gary Hall, Sr. speak was mesmerizing, and in his soft-spoken tone, he still commands the attention of the room as folks listen to his every word. The notions that he presents — coupling motions, frontal-drag, vortices, etc. — are truly on a scale well beyond the everyday on-the-deck Masters coach, but he does a great job of taking the information he gathers with world class athletes and bringing it to an understanding level for that on-the-deck coach. I came away with things that I not only need to focus on, but some simple fixes that each swimmer can build into their every lap to improve. On the flip side of Gary’s information, there was Bruce Gemmell, Katie Ledecky’s coach early on in her career. Bruce did not delve deeply into the science of swimming. His approach was more about a feel for the athlete, how they were doing, and paying attention to the simpler things that I notice and keep track of with all my swimmers: stroke count, stroke rate and tempo. Much of his information was much simpler and more relatable as, I imagine, many other coaches operate on the poolside level as he does. It was also a great experience to be in the water while Gary ran us through some of the drills he uses for teaching and feeling butterfly and breaststroke. It’s not every day you get to swim a drill set and finish at the wall and look up to see Gary Hall Sr giving you a thumbs up for a job well done. 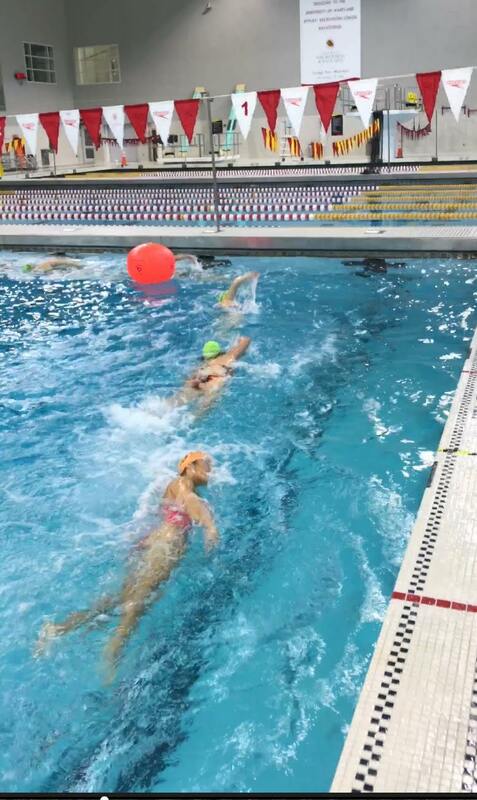 The pages of the LMSC newsletter could not hold all the topics and takeaways from the NCC, but check out my This is a “DRAG” Clinic on January 27th where we will put to paper and practice many of the learned items from the NCC applicable to Masters swimmers, especially how we can reduce frontal drag on many fronts, no pun intended. 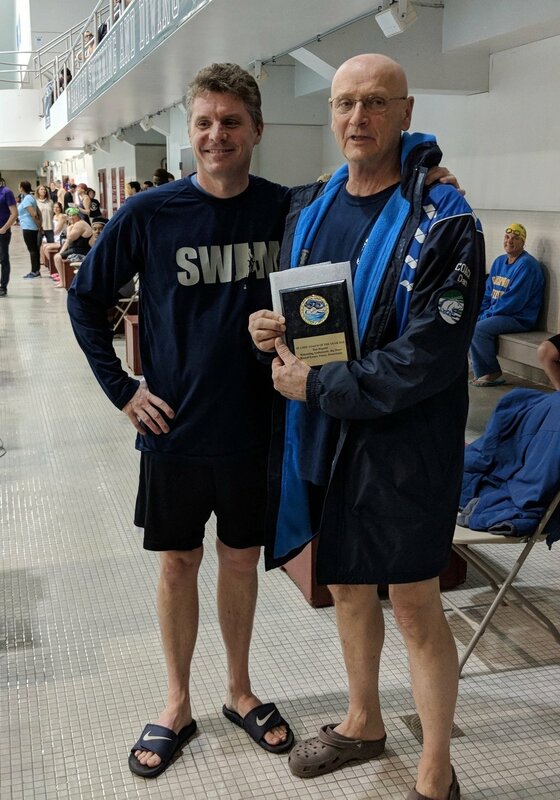 I would like to thank the LMSC for providing ample funding and support to myself and all the other coaches whom were able to take advantage of this bi-annual opportunity offered by USMS. I am looking forward to the NCC 2 years from now in the middle of the country as well as bringing this year’s information to our vast expanse of New England Masters swimmers. Swimming since the age of 14, David is a level 3 USMS & ASCA-Masters coach as well as an ALTS Certified Stroke Technician. David has spent 15 years as an aquatics professional operating aquatic facilities and programs from NJ to MA. David serves as an adjunct faculty member at MWCC and FPU and most recently as an Assistant Coach at Keene State College. 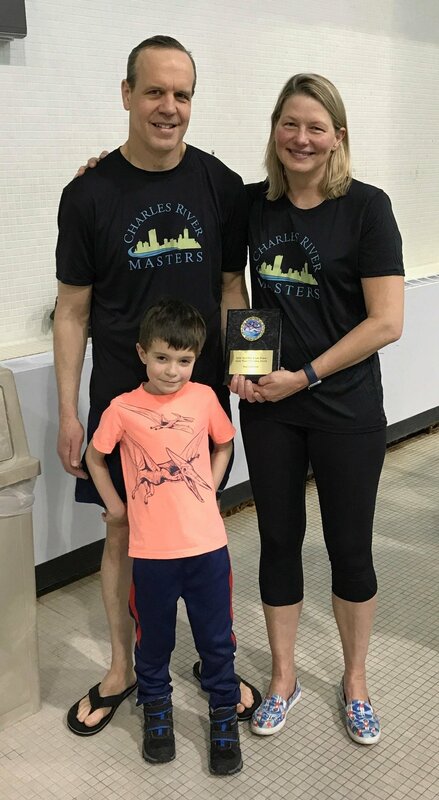 He is a member of the Granite State Penguins and has competed at 2014’s World Masters Championships in Montreal as well as a swimmer/ on-deck coach at 3 USMS National Championships since 2015. All applicants are required to complete the Town’s employment application form, which can be found under the "Attached Files" section of the job posting at www.concordma.gov/jobs. Completed applications should be sent via email to jobs@concordma.gov. Please use the subject line "Swim Coach" in your email. Resumes may be attached as additional information but cannot serve as a substitute for completing the application form. Please do not include any information pertaining to age, race, color religion, national origin, ancestry, gender, gender identity, sexual orientation and physical/medical condition or history on your application. Applications will continue to be accepted and may be considered until the positions are filled. All applicants will be notified of their standing in the process as soon as a decision has been made regarding their individual application. Individuals who need accommodation in order to participate in this process should contact the Concord Human Resources Department. Liquid Assets (LANES) is looking for one to two part-time coaches to join the team’s coaching staff. About LANES: We are a 501(c)3 organization and Boston's only Masters swim team for New England's Gay, Lesbian, Bisexual and Transgender community and their friends and allies. Team members span a range of ages and abilities -- from avid competitor to fitness swimmer. Qualifications: We are looking for part-time Masters Swim coaches. We are a competitive Masters Swim Team so coaches must have previous experience in creating and coaching high-level workouts. Weekday practices are held in the evenings at pools in Boston’s South End and Dorchester neighborhoods. Weekend practices are held in the mornings (9-11am approximately) at the same pools. Requirements: Candidates should have swim coaching experience, knowledge of stroke technique, the ability to write workouts, and a positive attitude. Competitive swimming experience is preferred but not required. To apply: Please submit resume to the LANES Board at BostonLANES@gmail.com. "Gimme an H" ... "H"
"Gimme a P" ... "P"
"Gimme a C" ... "C"
"What's that spell?" ... "HPC"
I looked up and yes, that was Bill Davis of Charles River Masters in the middle of a group of adult athletes joyfully screaming at the top of their lungs. With a smile, I realized that their spontaneous cheer meant our coaching staff had met an important goal -- to make each one of these swimmers from around the globe realize they were an essential part of something special: The High Performance Camp. After serving as one of the three assistant coaches at last year's High Performance Camp, it was an unexpected honor to be invited to serve as the head coach this year. As soon as HPC Director Hill Carrow offered me the position, I started making mental notes of elements I wanted to keep from 2017 and those I thought we could improve. The first step was to invite three other coaches to take part. Our goal was to find top coaches with different strengths. We got acceptances from three USMS Level 4 coaches: Mike Hamm, world-ranked breaststroker from Coeur de Laine, ID; Lisa Brown, open-water swimmer extraordinaire from Indy Aquatics; and Trey Taylor, who on the second day of camp learned that he will be receiving the Kerry O'Brien Coaching Award at the 2018 USMS Convention -- 'nuff said! Extensive video recording - Each swimmer was recorded above and below the water for each stroke, doing all turns and starts AND with the addition of a power graph during their best stroke. All video analysis was done in the evening with the whole group watching and all coaches commenting. Although this might sound horrifying to some, the process was actually very productive with all swimmers seeing common mistakes and unique challenges. Additionally, these sessions were an opportunity for everyone to get to know their fellow swimmers even better. In depth lectures on each stroke with accompanying drill practice and stoke refinement - On the first full day of the camp, each coach presented their take on one of the four competitive strokes. These were grouped as long-axis strokes (free and back) and short-axis strokes (breast and fly). A practice followed each section with drills shown that focused on the points made in the presentations. Dr. Genadijus Sokolovas - Dr. G. is a world renowned physiologist who works with the US Olympic Team and Olympians around the world. He has developed software that can show a swimmer definitively the parts of their stroke that contribute to propulsion or create resistance. 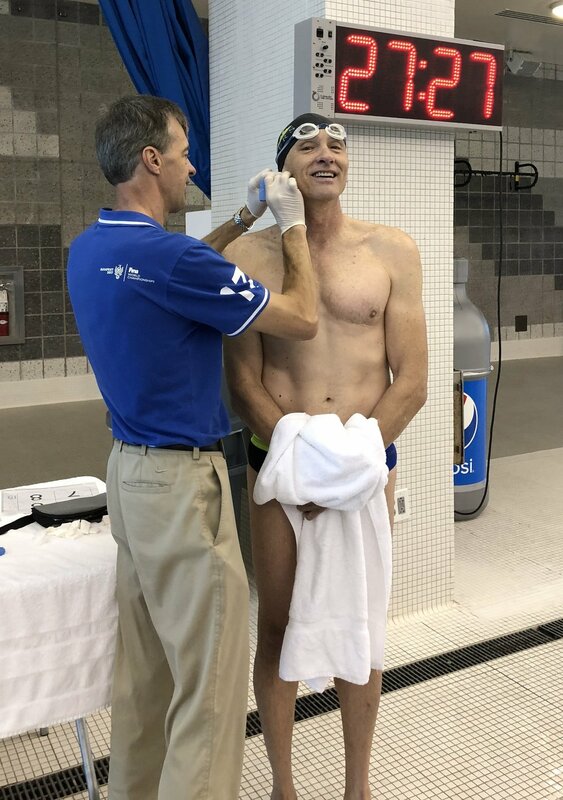 Along with thorough blood lactate testing and heart rate monitoring, he gave each swimmer a final consultation to explain what the data showed. Swimmers learned if their bodies are better suited to long-distance or sprint distances, what strokes they do best, and where they generate the most power in each element of their stroke. Besides the testing, Dr. G. presented two lectures that were each too short at 2 hours. He has extensive video documentation of most of the current Olympic Champions. As a student of the sport, it is enthralling to listen and watch an objective analysis of Michael Phelps and Katie Ledecky. All swimmers left these presentations with a better understanding of the physiological systems that contribute to a swimmer getting from one side of the pool and back in the most efficient way. 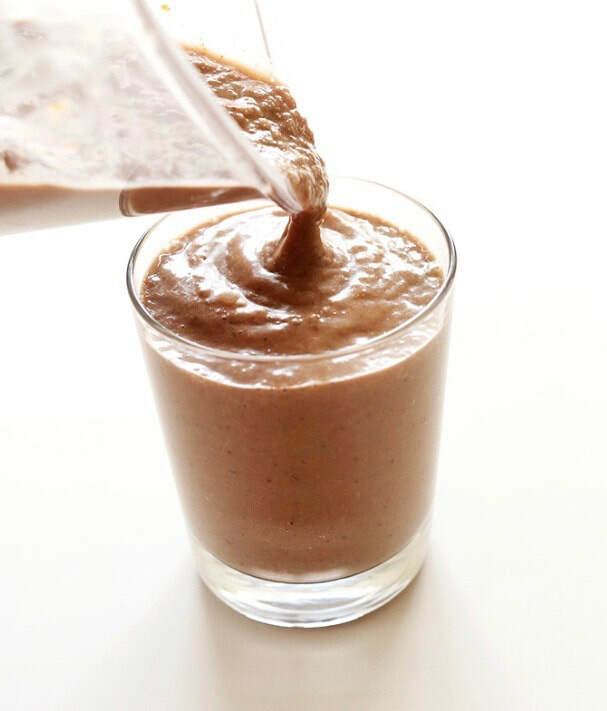 Jen Brunelli, Carolina Panthers Team Nutritionist - Also an accomplished D1 swimmer, Jen offered real-life, rational and down-to-earth advice on good eating habits for the serious athlete. Coming from a professional perspective where optimizing each football player's physical potential nutritionally is scrutinized on a daily basis, this self-described "science nerd" offered our swimmers great tricks to keep healthy and perform at peak levels. If passion for a subject is contagious, then everyone listening to Jen will apply everything she said. Besides all this, swimmers were analyzed by a physical therapist, got tips from a sport psychologist, and learned how to set realistic goals for themselves. Combine this with copious amounts of good food, a fun night at a local bowling alley and some enthusiastic karaoke performances, I believe that everyone involved walked away feeling that the USMS High Performance Camp set them up for a successful 2018/19 swim season. 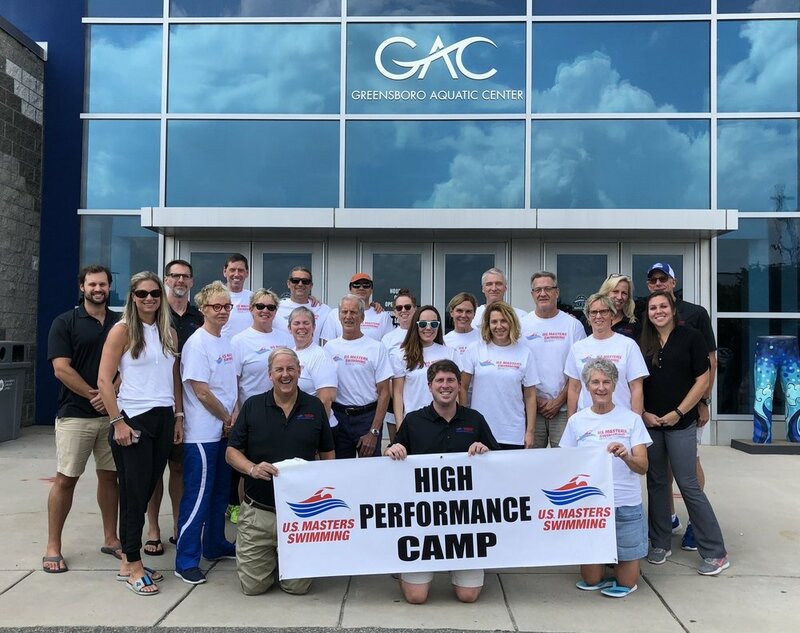 The National Coaches Clinic (NCC) is a USMS sponsored event bringing in some of the most experienced and knowledgeable swim coaching resources for a 3-day seminar geared towards Masters swimmers. The clinic provides traditional classroom presentations, opportunities to build community with other coaches and an in water session to further practice skills. This year's Clinic will be held in College Park, MD from October 19-21. The NE-LMSC is committed to supporting the professional development of its coaches and we hope that many will be able to attend the NCC in this and in coming years. Any NE-LMSC coach who successfully completes the 2018 USMS NCC will receive a $100 scholarship reimbursement. In addition to the above $100 scholarship three NE-LMSC coaches will receive an additional $400 stipend reimbursement to support travel expenses. In an effort to provide ongoing transfer of knowledge from the clinic each of these three coaches will be required to write one article for the NE-LMSC website/newsletter and host one swimmer or coach clinic prior to March 2019 pertaining to the information shared at the NCC. The travel stipend reimbursement will not be provided until these two actions have been completed. The NE-LMSC coaches chair, Crystie McGrail, will support these coaches receiving financial reimbursement in completing their required clinics and newsletter articles. A panel of three representatives from the NE-LMSC board will review applications and select the candidates for the travel reimbursement. Please direct any questions to Coaches Chair, Crystie McGrail.